It’s not uncommon for Bollywood to have a special connection with a co-star. 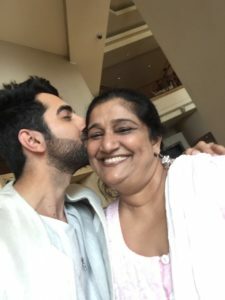 But Ayushmann Khurrana has a special connection with veteran and much respected character actor Seema Pahwa. For three films, Ayushmann has played son-in-law to Seema Pahwa. Be it the much applauded and loved Dum Laga Ke Haisha, and the romantic comedy Bareilly Ki Barfi or the very intriguing Shubh Mangal Savdhan, Ayushmann has always had Seema Pahwa share screen space with as his Saas. 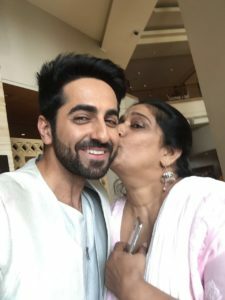 Given that Seema is a fine actor who has also coached upcoming actors for typically Indian roles, Ayushmann has enjoyed each collaboration with her. Ayushmann plays typical heartland characters with finesse and conviction that stands out amongst this generation. As for his quirky connect with Seema Pahwa onscreen, it only reiterates his command over his craft as an actor.